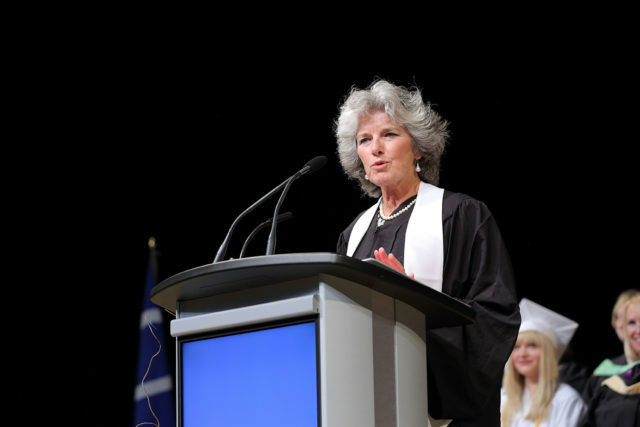 Eva Friesen, president and CEO of the Calgary Foundation, gives a speech to the graduates after receiving her honorary diploma from Bow Valley College on June 19, 2017. Photo courtesy of Bow Valley College. Bow Valley College (BVC) awarded honorary diplomas to two individuals during its spring graduation ceremonies. Eva Friesen, president and CEO of the Calgary Foundation (CF), and Paul Charette, former Colleges and Institutes Canada board member and current chair of the board of directors for Bird Construction, received honorary diplomas in business administration from BVC’s Chiu School of Business in two separate ceremonies. The honorary diplomas were presented during graduation ceremonies in which over 900 learners crossed the stage of the Jack Singer Concert Hall. She added that CF exists to help build a community where everyone belongs, and that there are many intersections between CF and BVC. Charette, who grew up in a small community north of Winnipeg, spoke about the struggles of his youth and the lessons learned from it. He then provided some sage advice for the graduates. 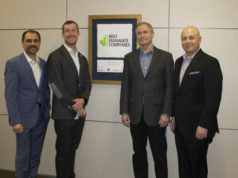 “The recipe for success in business and life in my opinion is as follows: get a good education – you now have a great start; but in this age of a knowledge-based economy, rapidly changing job descriptions and new technologies, lifelong learning is more important today than it has ever been,” he said. He went on to say the jobs the graduates might have for the next five years could disappear, and they may be working in new jobs within the next 10 years that don’t even exist today. “You need to be well prepared,” he warned. Both honorary diplomas were handed out by Laura Jo Gunter, president and CEO of BVC, which is Calgary and region’s only comprehensive community college with more than 15,000 full- and part-time students.